Breakfast at Biscuits & Company. From an epicure’s standpoint, Maine has always been the ultimate destination for all things lobster, as well as chowder, wild blueberries, and fried clams, mainly served at waterfront shacks or family-style restaurants with lobster bibs and ships-ahoy décor. Yes, there have been outliers, like Primo in Rockland and The White Barn Inn in Kennebunk. 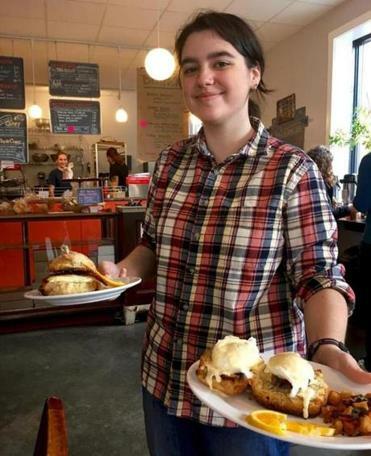 But when it came to innovative cooking using locally-sourced ingredients in a cozy setting, Maine’s pickings were slim, save for what’s going on in Portland, which became a progressive food mecca several years ago. Thus, on a recent jaunt to Maine, I was thrilled to discover a slew of fabulous restaurants up and down the coast. Some were dressy, most were casual, and all channeled the flavors of the Pine Tree State, but in a very personal way. Inside this cheery, yellow-painted house with black shutters and a red door, you’ll find gourmet pizzas and chunky, seasonal salads. Chef-owner, David Ross, who named the restaurant after his son, Owen, also names each pizza and salad after the farm, farmer, or food artisan responsible for one or more of the dish’s ingredients. Hence, the Alma Salad pays homage of Alma Farm in Porter and last fall contained chopped kale, crisp apples, sweet beets, and Feta cheese. Sensing that former President George H.W. Bush’s backyard could use a splash of Spain, Chef Shannon Bard opened Toroso, a cheery wood-, tile-, and fabric-filled spot in Kennebunk. It’s the second restaurant, along with the modern Mexican Zapoteca in Portland.